Ok so I have an ambitious idea where I want to make a dynamic path routing algorithm. So far I got a script that detects the road texture, tries to find the middle of it, and plops a cube in the middle... then repeats every 30 meters... anyway, instead of a cube, I plan to put a spline control point. I've only ever made splines with the GUI interface. I've been fishing around the API and am utterly confused. Here's what my algorithm currently does. I plan to have it detect when you're coming close to a fork in the road and the user will choose left/right. 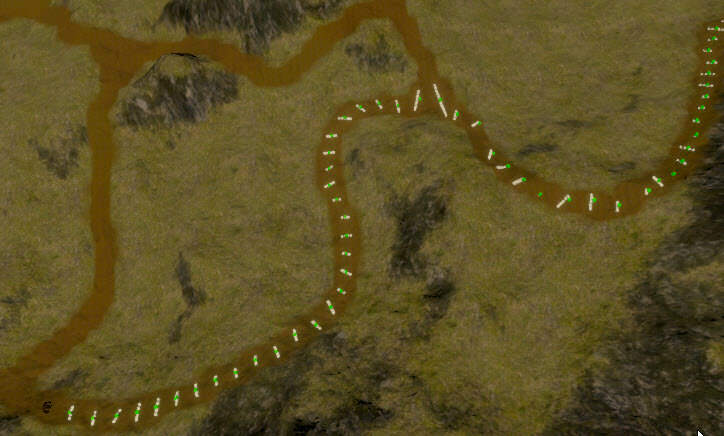 But you can also press a button and "free roam" with no spline, then press another button and it'll create a new spline to the nearest dirt road and continue with the pathing algorithm. It'll be so cool if this works. I need the simple above, but if you have any other tips or things to keep in mind while doing such a task please let me know! (08-09-2018, 03:32 AM)mythstified Wrote: I've been fishing around the API and am utterly confused. Can you please explain to me what confuses you? Do you have any suggestions to make the API easier for you? I ask because I don't see the complexity in finding the method to add control points to a spline. Maybe I became blind to the issues you encountered, so your opinion will be helpful. (08-09-2018, 03:32 AM)mythstified Wrote: if you have any other tips or things to keep in mind while doing such a task please let me know! For better performance, use the Add method override that takes the array of all positions at once, instead of calling the one that adds a single CP multiple times. Premaping will allow you to tweak/correct things if your automatic process is not perfect. That can be very useful.